We have gain expertise in manufacturing, supplying and exporting qualitative array of Gas Plants. These gas plants are widely used in industries for generating gases. Easy to install, these plants are cost-effective and requires low maintenance cost. We manufacture these plants using quality raw material procured from reliable vendors thus fabricating them using modern tools and advanced technology under the supervision of expert professionals. Offered gas plants are highly demanded world wide for the reliability and high quality that our customers gain from us. These gas plants can also be customized as per the needs and requirements of our valued patrons. Customer can avail the facility of delivery at their premises within stipulated time. We are dedicatedly engaged in manufacturing, supplying and experting an exclusive range of PSA Oxygen Plants that are fully automatic and requires low generation cost. These plants are highly required in glass industries, blazing industries and steel industries. We are offering patrons reliable and easy to install plants that are highly efficient in performances. These plants pass through various quality check process ensuring best outcome at customer's end. Customer can avail these qualitative plants from as per their needs and requirements. These are required in industries such as Glass Industry, Steel Industry, and Brazing Industry etc. Our oxygen gas generators based on PSA Technology and that is called “Pressure swing adsorption’’ (Water PSA Oxygen Plant). The main ingredient of Oxygen Plant is ZMS (Zeolite Molecular Sieve) and ZMS is having indefinite pores on the surface, which adsorb the molecules of Nitrogen, Moisture and Unwanted gases from compressed air. Oxygen gas, which is not adsorbed into the surface of ZMS comes out from adsorbed tower and collects in the surge vessel. It consists of two-absorber tower, which is filled with Molecular Sieves. The absorber towers are interconnected with change over control valves, controlled by sequence timer with a standard time cycle. After every certain time cycle adsorbed tower, automatically swings and Oxygen gas is produced continuously. The maximum Oxygen purity level is 93-95%. 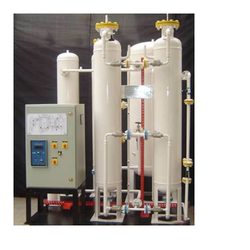 We are instrumental in offering a wide range of Nitrogen Gas Plants. The product offered by us are made using high grade material and components. Apart from this, experienced professionals check this products at various parameter, at the vendor's premise, before the final dispatch. These are available at market leading rates. Atmospheric air comprises of 78% nitrogen and the PSA process utilizes CMS to extract this Nitrogen from air. PSA process consists of 2 vessels filled with Carbon Molecular Sieves (CMS) and Activated Alumina. Clean compressed air is passed through one vessel and nitrogen comes out as product gas. The exhaust gas (Oxygen) is discharged back into atmosphere. Upon saturation of the molecular sieve bed, the process switches Nitrogen generation to the other bed by automatic valves, while allowing the saturated bed to undergo regeneration by depressurization and purging to atmospheric pressure. Thus 2-vessels keep cycling alternately in Nitrogen production and regeneration ensuring Nitrogen gas is continuously available to your process. 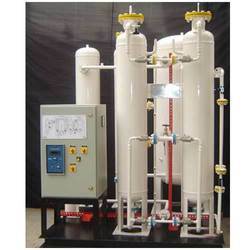 Our PSA nitrogen gas palant are fully automatic work 24x7 non stop. Ecnomical, very less maintainance, easy to operate. Availabe from 10 Nm3/hr to 1500 Nm3/hr capacity. Normal pressure avalable is 5 Kg/cm2. Delivers very dry nitrogen upto -50 degree dew point.